The result is a “quiet” custom, one that looks like it could have been built by the factory. 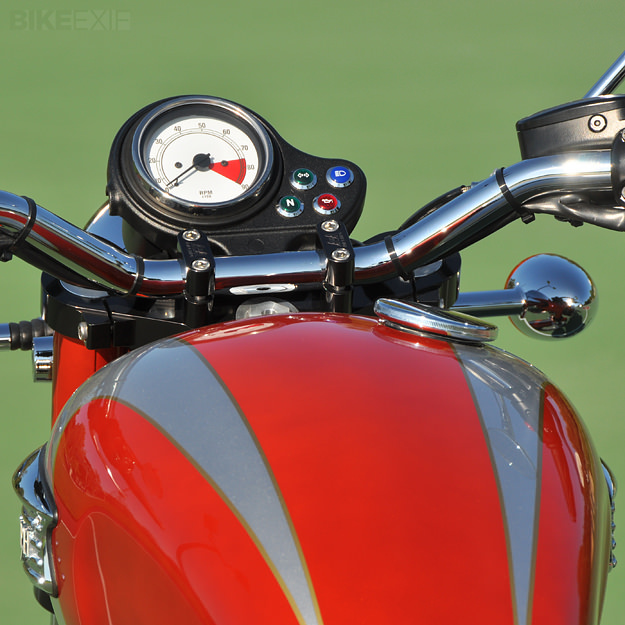 But in fact, almost no part of the original bike remains untouched. Start with the main frame: its bolt-on engine cradle tubes are replaced by Streetmaster components plumbed with oil lines to act as an outsized cooler. Between the forward facing tubes and their extra capacity, there’s no need for the stock oil radiator, which cleans up the look at the front of the bike. Still up front, Pollock went to flat-track specialists A&A for a set of their adjustable billet triple-clamps. These hold 43mm Buell M2 Cyclone fork tubes. 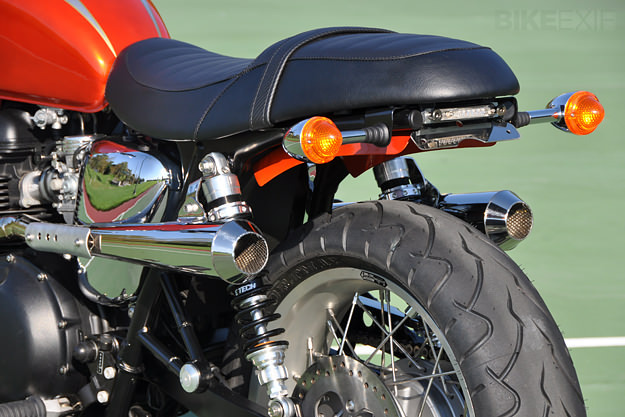 Stock headlight ears shortened 3/8″ and reworked inner rubber sleeves allow fitment of the standard headlight shell and turnsignals, giving a factory feel, as does a Thruxton front fender, shorter than the Bonnie part. Mule/Race Tech shocks are slightly longer than stock. There are big upgrades to the wheel/brake package—namely wider Sun aluminum rims, 2.75 x 18″ front, 4.25 x 18″ rear, laced to the stock hubs. 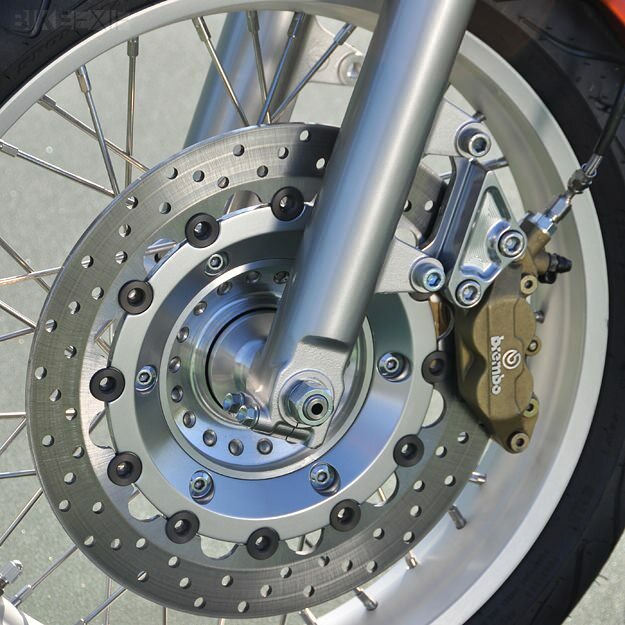 The front brake was bumped up to a 320mm Brembo rotor on a custom Mule carrier, pinched by a four-piston Brembo Goldline caliper. Dunlop Sportmax radials complete the rolling improvements. Motor-wise, again, nothing drastic, just a thorough massaging of the stock 790cc twin, starting with an airbox eliminator kit and carb rejet, plus reworked ignition from South Bay Triumph (2 degrees more advance, 1000 rpm more revs) and high-energy sparkplug leads. A set of prototype Mule up-pipes unleashes a few more ponies, not to mention a healthy dose of decibels. 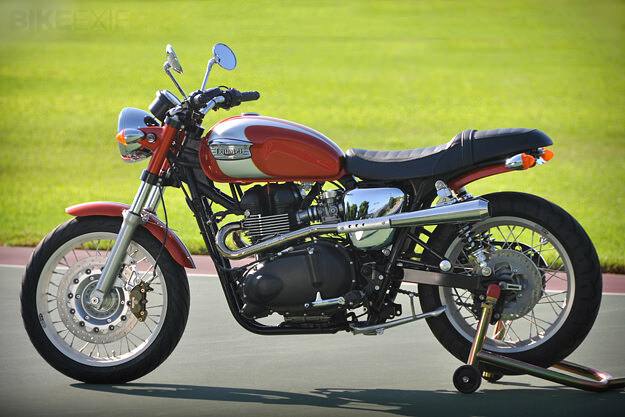 The Triumph parts & accessories catalog was consulted for the stepped saddle and chrome-plated side covers. Flanders chipped in with superbike-bend handlebars. Mule is responsible for the severely docked rear fender, relocated blinkers and tiny LED taillight. 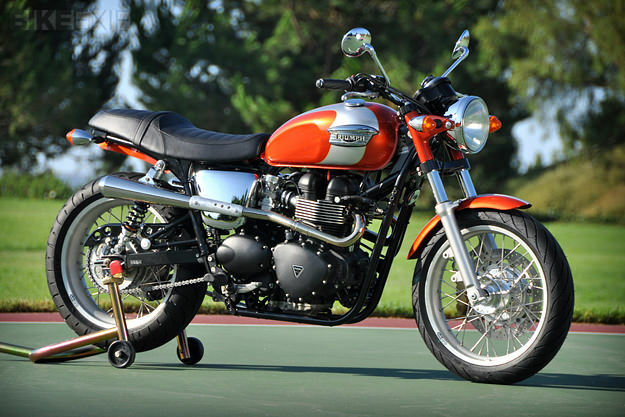 The whole lot is capped off by a coat of Olympic Flame paint, a candy metallic orange that was once part of Triumph’s 1960s color palette —and judging by how it looks here, should be again current day.